George R.R. 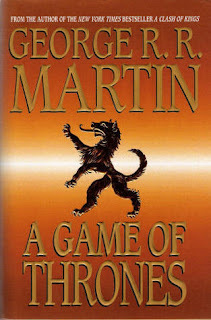 Martin is such a good writer that it's blatantly clear that he cut a blood magic deal with Mirri Maz Duur, cutting a horse at the throat and slaying the unborn Dothraki child of Khaleesi -- destined to mount the world -- to secure the unholy deal of granting him unimaginable powers in storytelling and word economy. Martin bring's an unfairly skilled touch to his saga, matching the drama and tension of his sweeping, unpredictable story with masterly writing that would be unbearably fascinating even if it was about something boring and pointless. He fuses the descriptive economy of Hemingway with the storytelling momentum of J.K. Rowling to create something that makes all other popular fantasy writing seem pathetic and hollow by comparison. Compared to Martin, J.R.R. Tolkien and C.S. Lewis are hacks. The narrative shifts of his chapters, moving from the point of view from one character to another, is a master class in granting distinct voices to the people inside a writer's head. One moment he can capture the whimsical view of a 7-year-old invalid, and the next have you sympathizing with the Machiavellian ambitions of an incestuous traitor. Martin has much to say about race, religious influence on government, geopolitics, the power of oral history as it relates to education, parenting and sexual repression, but Martin keeps his thoughts to himself and lets his readers sort it all out as they watch him juggle his fascinating, cruelly disposed-of characters he sends into dizzying entanglemes with one another. A Game of Thrones is one of the best books I will ever read, but I will stop short of The Book Is Better snobbery, even if I wouldn't argue with those who swear it is. For me, the HBO is so damned amazing that even Martin's writing can't match it. You can watch the series, ignore the books like most everyone else and be just fine. But if you are at all interested in dorky oversexed fantasy and fail to start this series, you have failed at life and need to take a step back and re-evaluate things. Take the black, commit to the monastic duty of reading or listening to the written word, and let your imagination dance with dragons to see how it compares with the HBO vision.